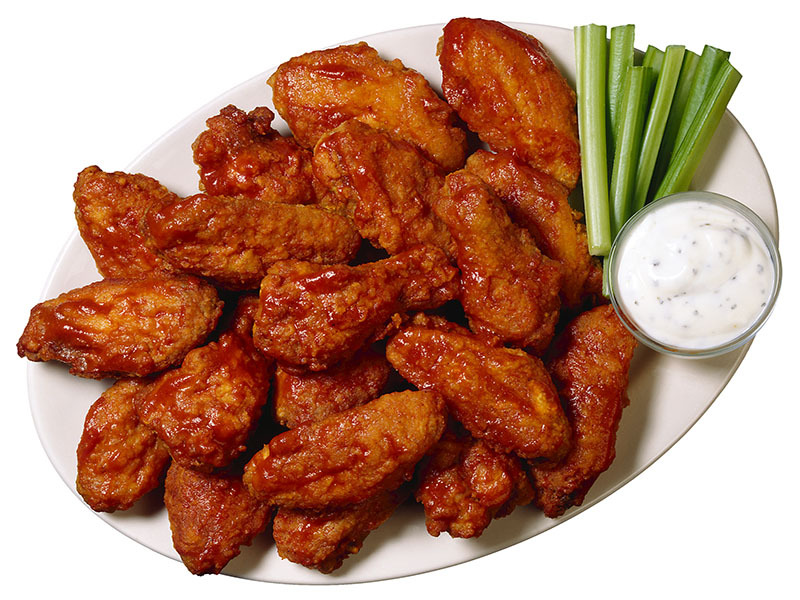 FRIDAY, Feb. 3, 2017 (HealthDay News) -- To burn off the calories in 10 Buffalo crispy chicken wings, you would have to run the length of 149 football fields, a nutrition expert says. Buffalo wings are a Super Bowl party staple, with estimates suggesting more than 1.3 billion will be served this Sunday while the New England Patriots battle the Atlanta Falcons, according to Charles Platkin. He's the executive director of the New York City Food Policy Center at Hunter College. Super Bowl Sunday is second only to Thanksgiving for food consumption in the United States, and armchair quarterbacks can pack on unneeded calories, said Platkin. Here, Platkin dishes out the exercise equivalents of some of Americans' favorite Super Bowl party foods, and offers healthier alternatives. The 10 Buffalo crispy chicken wings have 950 calories. Add the 460 calories in three ounces of blue cheese dipping sauce and you have 1,400 calories in all, Platkin said. Cut some calories by making the wings yourself: Take off the skin, bake them instead of deep-frying them, and use hot sauce instead of blue cheese sauce, he suggested. A foot-long meatball sub with provolone cheese and marinara sauce on an Italian roll can have as many as 932 calories, Platkin said. Downing this gridiron favorite would require 109 minutes of climbing stadium stairs to burn off. As an alternative, he suggested making your sub with turkey meatballs, low-fat mozzarella and a whole grain bun. To burn off the 170 calories in just one handful of mixed nuts, you would have to do 44 minutes of vigorous exercise. Limit your consumption to just 7-10 nuts, Platkin said. Lager beer can have 180 calories per 12 ounces. Choose light beer instead. Instead of eight regular potato chips with dip (204 calories), substitute popped or baked chips and low-calorie dip made with nonfat yogurt or nonfat mayo. To make five pigs in blankets (330 calories) a little healthier, use low-calorie wieners. Instead of wrapping them in dough, spice them up with fancy mustard, Platkin suggested. Making deviled eggs? Use low-fat mayo, or just have hard-boiled eggs with hot sauce or mustard. One cup of chili with beef, beans, peppers, onions and other vegetables has about 350 calories, and a dollop of sour cream or some shredded cheese adds another 150 calories. As an alternative, use ground turkey breast instead of beef, or make vegetarian chili, and top it with low- or nonfat sour cream and cheese. There are 152 calories in four pita chips with guacamole. Try not to sit with a big bowl of chips and guacamole in front of you while you watch the game, which encourages you to eat mindlessly, Platkin said.